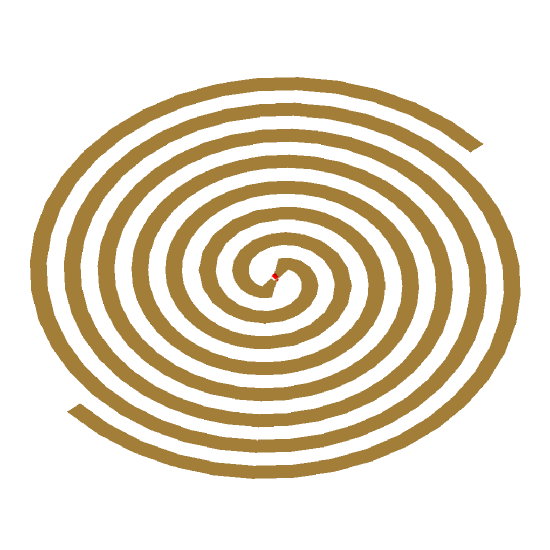 Image of the Self-complimentary Archimedean Spiral. 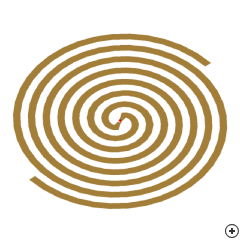 Archimedes spiral, also called Archimedean spiral, antennas are considered to be frequency independent. However, in practice they have finite bandwidth due to their finite arm lengths and finite inner gap width. The minimum frequency is determined by the outer diameter of the spiral and the maximum frequency by the inner diameter and the precision at the feed region. Archimedean spiral antennas are inherently circularly polarized with relatively constant input impedance and radiation patterns over wide frequency ranges [Filipovic, D. S. and Cencich, T.]. If area is at a premium the ends of the arms are sometimes terminated with loads to compensate for the end reflections at low frequency operation. A typical application of this antenna is in EW (Electronic warfare) where it is typically used in RWRs (radar warning receivers) or jammers. In these applications a unidirectional beam is required, which is achieved by cavity backing. The cavity is partially filled with an appropriate absorbing material for multi-octave bandwidth applications.